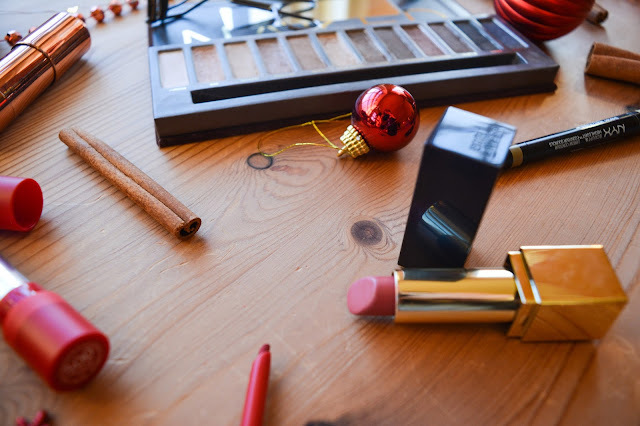 With the next few days being so busy and exciting, I thought I'd do a shorter post on my top picks for this year's Christmas makeup. 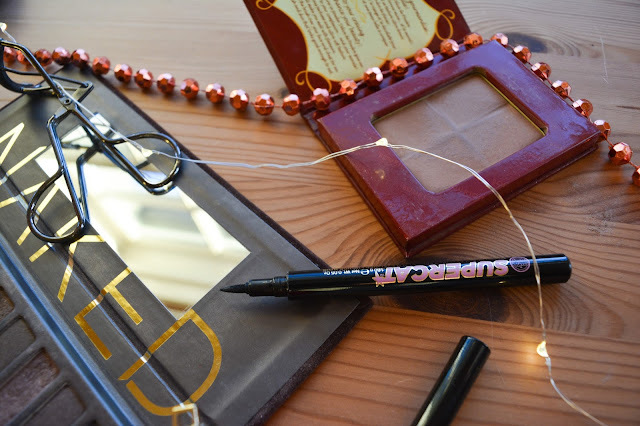 Eyes - The Maybelline Falsies mascara is one of of my absolute favourites. It's so lengthening and gives such a beautiful curl with it's curved wand. My top choice for an eyeshadow palette for Christmas is the Urban Decay Naked palette. 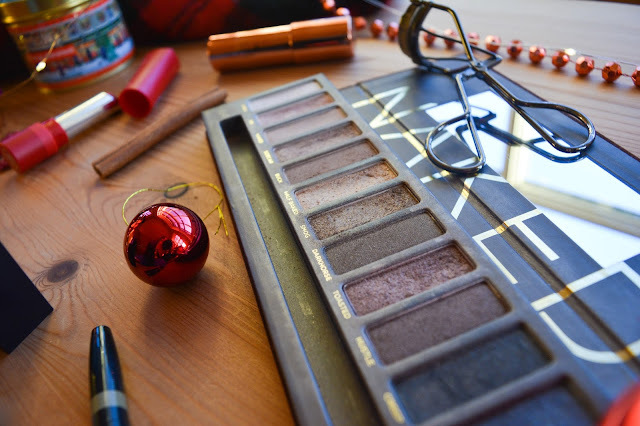 It has a stunning range of golds and taupes, enabling you to create a lovely festive look with all the shimmer! The NYX sculpt & highlight brow contour is a product that I haven't really heard much about it but I love it! With a really thin pencil it allows you to create your preferred brow look then using the highlighter end you can brighten your brow bone. Christmas is the perfect time for a winged liner, which is a nightmare to do, so having a product that makes it easier is essential. I use the Soap & Glory Supercat liner which is a fine felt tip liner that is pretty simple to use. Face - For a long time I've been using the Bourjois bronzing powder (the one that looks like chocolate) and I still love it. As I have quite pale skin, finding the right bronzer can be difficult but this one is great and you can build it up so easily! 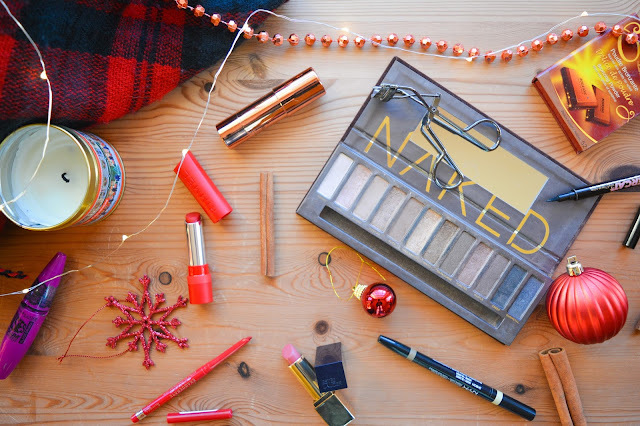 Now for highlighter...I couldn't do Christmas makeup without including highlighter! One of my favourites is the highlighter stick in the Rosie Huntington Whitley for Autograph collection as you can create a subtle highlight or a more shimmery look. Lips - The right lipstick is the perfect finishing touch to your makeup so I have two shades that I'll be wearing this Christmas. First, Estee Lauder, Pure Color Envy lipstick in Dynamic which is a stunning shade for winter. Secondly, a classic red is a necessity and I love the Rimmel lipstick in the shade Take the Stage. 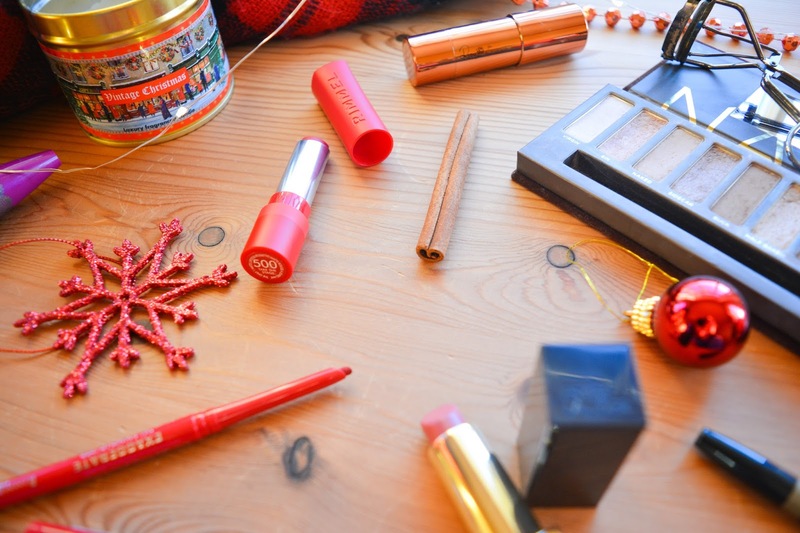 Before applying the lipstick I use the Exaggerate lip liner in the shade Red Diva. Christmas is always the perfect excuse to eat all the food, am I right?! Even better when you can make it yourself! 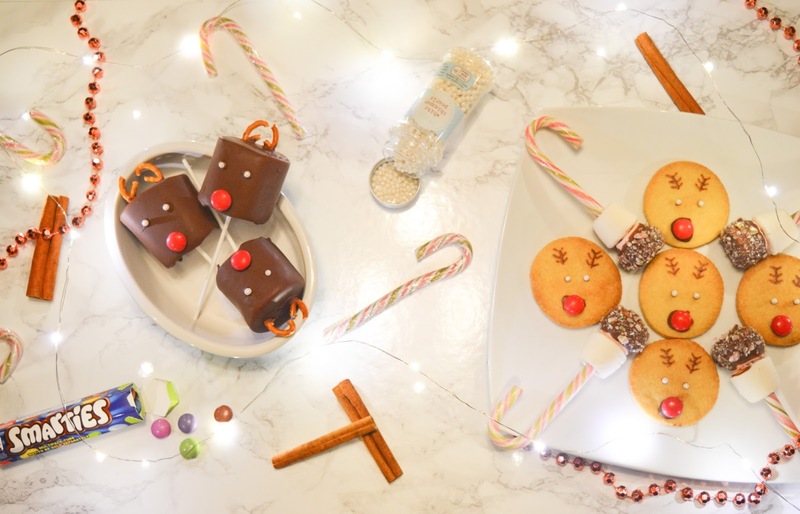 I've made three easy Christmas treats that you can make whether you're throwing a festive party, looking for something to bake on Christmas day or just something to make for yourself (no shame) - these are perfect! Chocolate (for melting) - amount depends on how many you want to make. Once you have made the shortbread and left it to cool, you can begin with the decorating. Melt the chocolate in the microwave (15 secs at a time) until it's smooth. 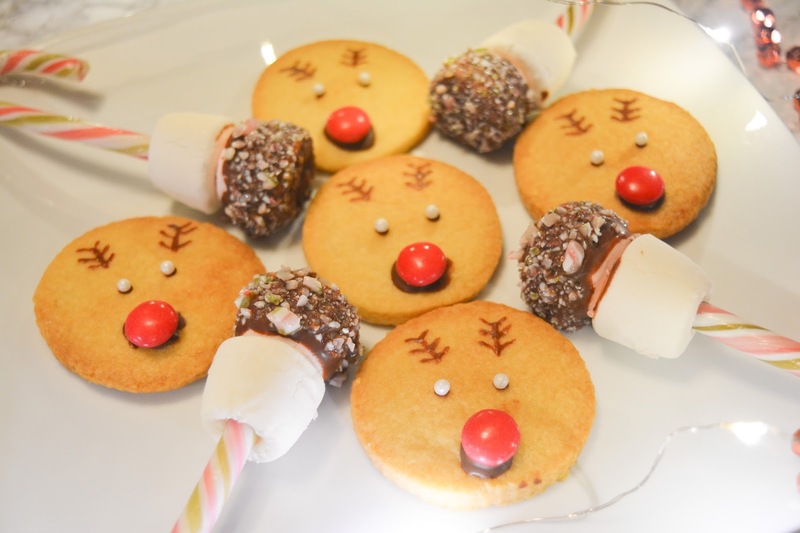 Using a teaspoon, dab a tiny amount of melted chocolate near the bottom of the shortbread and put a red Smartie on top to create Rudolf's nose. Using the teaspoon again, put two dots of chocolate above the nose for the eyes. You can either leave the eyes like this or you can make them white. I used white shimmer pearls from Tesco to create the eyes on my reindeer. Now for the trickiest bit...Using your cocktail stick you want to create antlers with the melted chocolate. Just get a small amount of chocolate on the tip of cocktail stick and lightly draw them on (check the photo above). The trick with this is to have as little chocolate on the stick as possible. Crush two candy canes in a food processor and pour them onto a plate. 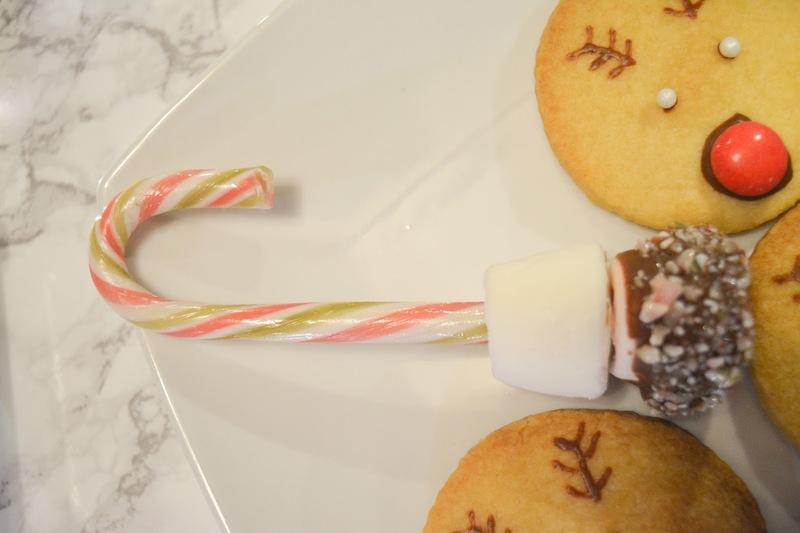 Melt the chocolate then slide two marshmallows onto the end of a candy cane. Cover the bottom marshmallow in the melted chocolate. Roll the chocolate covered marshmallow in the crushed candy cane. Now all you have to do is stir this into your hot chocolate for a lovely peppermint taste! Chocolate (for melting) - amount depends on ho many you want to make. Melt chocolate. Slide the cake pop stick through the marshmallow then cover it in the melted chocolate. Refrigerate the marshmallows until the chocolate has hardened. Using a teaspoon, dab a small amount of chocolate near the bottom of the marshmallow then place a red Smartie on it to create Rudolf's nose. 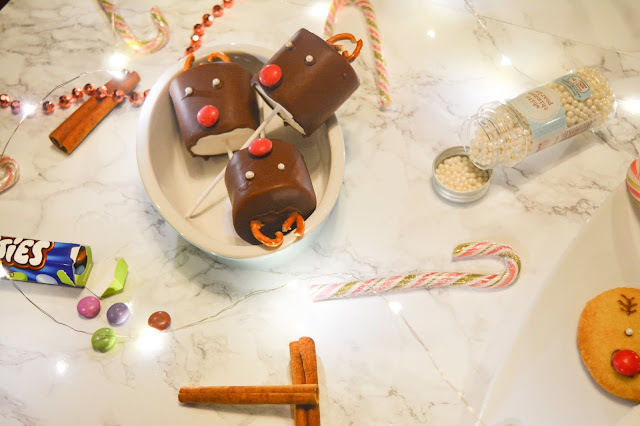 Do the same step just above the nose for the eyes, use similar balls as mentioned before or use melted white chocolate to dot eyes on the reindeer. 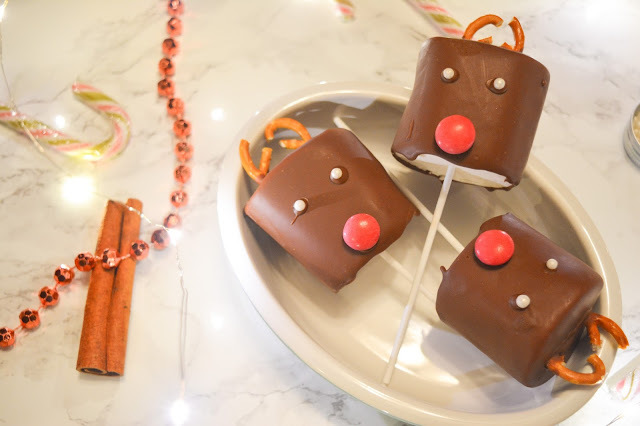 Break pretzels in half to create the antlers then gently push them slightly into the top of the marshmallow. You may want to use some melted chocolate to help the pretzels stick. *I haven't listed any measurements/weights as everything can be adjusted depending on the amount you are making. We have reached December and that means it's time to get seriously cosy! 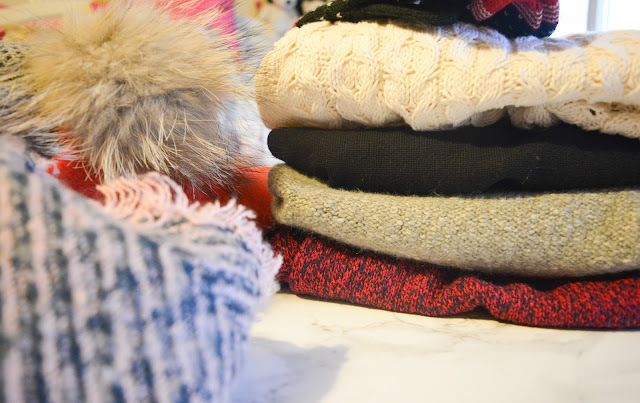 I've rounded up a few of my winter wardrobe essentials that I couldn't live without in those chilly days. Cosy Jumpers - I think this is the most important because they just keep you so warm! There's so many different styles and colours of jumpers out there but this year, the higher necks have definitely been a popular trend! I love them because they just keep you even cosier and I have a few that I love from H&M (my favourite place to buy knitwear). This one, which I have in cream and black, is amazing for layering and this one is a bit longer with a higher neck for maximum warmth. 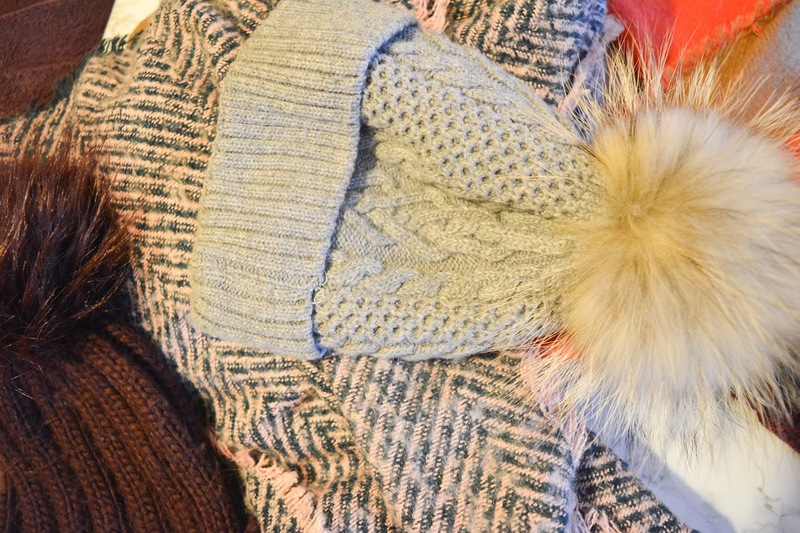 Scarves - Especially blanket scarves! I'm going to be honest, I have far more scarves than a girl could ever need but you know what? I don't care... I have so many different colours and sizes but if you're thinking of getting a new one I'd recommend a blanket scarf and one that will go with most of your outfits. ASOS are amazing for scarves which is where the pink and teal one in the picture is from and the other one is from Oasis. 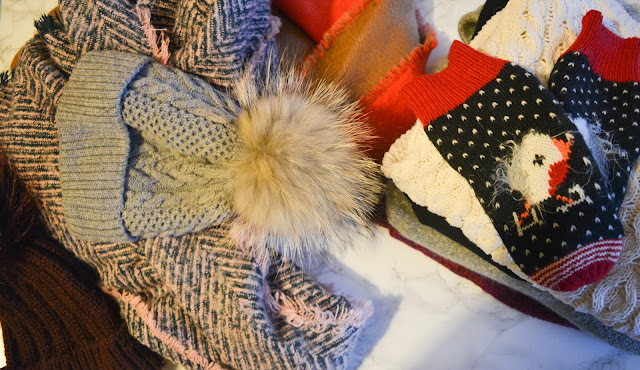 Woolly Hats - I could not get through winter without a woolly hat, especially one with a pompom on top because they're the best! I like my hats to sit quite tightly on my head rather than a beanie style but sometimes I find it hard to find the perfect fit. I got the grey one (above) in an independent shop called The Pretty Peg but for me Topshop always get it right with woolly hats. Warm Gloves - This is something I always forget about but having cold hands is horrible. So, this winter I'm making the effort to get out my gloves. The robin mittens (above) were from Next last year and they're so cute! I've found a few that I think are amazing - mittens from Jack Wills, touch-screen gloves from Topshop, suede gloves from H&M, faux fur trim gloves from Missguided and burgundy gloves from Boohoo. Boots - Finally, my favourite! When it comes to boots I can never have enough. I obviously need a pair for every occasion - everyday boots, fancy boots, long distance boots and the list goes on.... I personally love a heel on my boots because I'm so short but comfort is the most important thing! My favourite place to get them is Office but ASOS, Topshop, Zara and lots of other high street stores are also great!